The Wikileaks cables that anticipated the Russian invasion of Crimea. 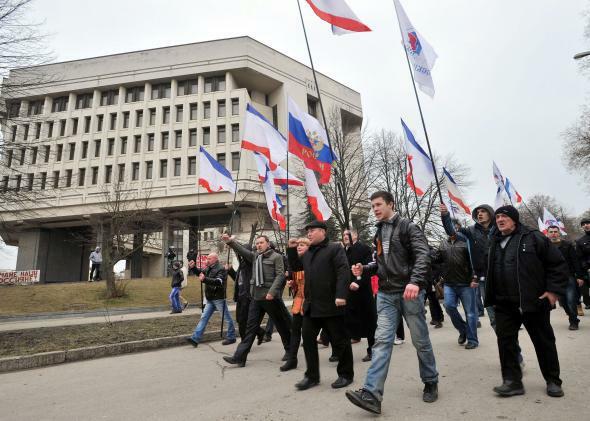 Pro-Russian activists wave Russian flags as they demonstrate in Simferopol, the administrative center of Crimea, on March 1, 2014. Given the degree to which this weekend’s events in Crimea seem to have caught the world off guard, I was curious to see if the Wikileaks cables contained any discussions by U.S. diplomats of a scenario like this one. Indeed, there is some now ominous foreshadowing to be found. Discussions with a wide range of contacts in Crimea November 20-22 and officials in Kyiv discounted recent speculation that a return of pro-Russian separatism in Crimea, which posed a real threat to Ukrainian territorial integrity in 1994-95, could be in the cards. However, nearly all contended that pro-Russian forces in Crimea, acting with funding and direction from Moscow, have systematically attempted to increase communal tensions in Crimea in the two years since the Orange Revolution. They have done so by cynically fanning ethnic Russian chauvinism towards Crimean Tatars and ethnic Ukrainians, through manipulation of issues like the status of the Russian language, NATO, and an alleged Tatar threat to “Slavs,” in a deliberate effort to destabilize Crimea, weaken Ukraine, and prevent Ukraine’s movement west into institutions like NATO and the EU. The cable notes that “the most active pro-Russian actors highlighted by our contacts were the Russian Society of Crimea and its affiliates, the Russian Bloc political party and the Crimean Cossack Union.” Russian Bloc has been particularly active in the last few days. setting up roadblocks on important highways in the region. On security guarantees, ASD Vershbow said that the U.S. regarded the 1994 Budapest memorandum to be still in effect, regardless of the expiration of START in December. We expect Russia to abide by the assurances in the memorandum, as he had stated publicly that afternoon in a speech to the Ministry of Foreign Affairs’ Diplomatic Academy. Russia is legally bound to respect Ukraine’s territorial integrity through a number of agreements as well. While such documents are important, just as important is building up Ukraine’s own strength and thickening Ukraine’s ties with the U.S. and other Western countries, so as to establish “facts on the ground.” That is why enhancing our military and security cooperation in concrete ways is critical. In addition, the Budapest memorandum and the NATO-Ukraine Charter contained provisions for consultation in times of crisis. Responding, Former FM Ohryzko asked, rhetorically, whether such consultations would matter if Russian forces were to take over Crimea. He noted that Russia had violated its commitments in attacking Georgia and had not been punished for this. While Horbulin believed that Russia has many non-military levers with which to influence Ukraine (above all, by stirring up trouble in the Crimea), he did not rule out the use of military force, especially if Ukraine’s new president proves not to be as pliable as the Kremlin may hope. …Horbulin characterized the Medvedev letter as unprecedented in the brazenness of Moscow’s attempt to interfere in Ukraine’s upcoming presidential election, with the message that “whoever becomes (the next Ukrainian) president must follow in the wake of Russian policies.” Since the 2008 Russian invasion of Georgia, Russian military action against Ukraine is no longer unthinkable. So it certainly doesn’t appear that a scenario like what’s playing out right now in Crimea was totally unanticipated. But neither the Ukrainian government nor U.S. officials appear to have thought of a way to prevent Russia from laying the groundwork for it.